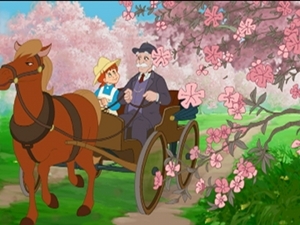 Anne of Green Gables is a book by Canadian author Lucy Maud Montgomery. It was published in 1908. It was written as fiction for readers of all ages, for a few decades has been classified as a children's book. Montgomery wrote the book after seeing a newspaper article about a couple that were mistakenly sent an orphan girl instead of a boy, yet decided to keep her. The portrait of Evelyn Nesbit by Rudolf Eickemeyer Jr. which inspired Montgomery. 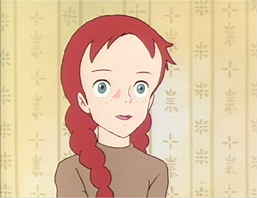 Anne as she appeared in the 1979 Japanese anime adaptation of Anne of Green Gables. Anne of Green Gables Facts for Kids. Kiddle Encyclopedia.